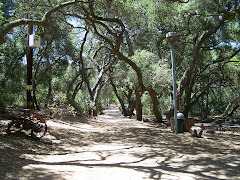 Orange County birding gets exciting when a birder spots a rare bird. 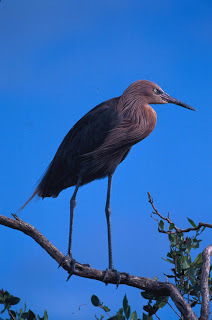 The Reddish Egret usually lives in Texas, Louisiana, Alabama, and Mexico and points south, but in Orange County and the rest of California, it is considered a rare bird. Recently, news regarding its presence has gone beyond the rare bird alert and the birding boards and made the local newspapers. 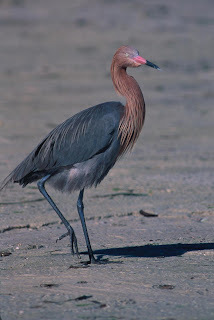 As a beginning birder in the 1980s, I first saw a Reddish Egret up in Santa Barbara near the zoo. I had no idea what it was and had to look it up in my book. However, I have seen them more recently right here in Orange County. Although still rare, Reddish Egrets have been regularly seen in the last few years at several locations in Orange County including Bolsa Chica Ecological Reserve. Only one or two and only once in a while, but regularly. The pictures I have gotten so far are with my zoom. The days I saw the Reddish Egret, it was out to the left of the observation outlook in the shallows. 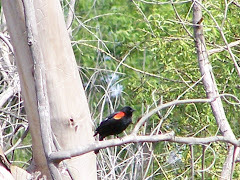 Last year I saw it by the bridge, but that was before my digital camera, so I didn't get any shots. Maybe later this year I will get a closer shot. Why does the Reddish Egret run around with its wings out? The most common guess is that its wings shade the water, taking away the glare, and allowing the bird to see its prey in the water. The running may flush the prey from hiding places. Reddish Egret dashing about with its wings stretched out at Bolsa Chica Ecological Reserve . Ready to make a mad dash across the water at Bolsa Chica Ecological Reserve . If ever a bird might have ADHD, it is the Reddish Egret. It dashes around with its wings held out looking for fish in shallows, usually partly salt water. It surpasses the Snowy Egret for active feeding. It has an auburn head and slate-colored wings. Its shaggy head plumes give it a kind of "bedhead" look. Strutting at Bolsa Chica Ecological Reserve . 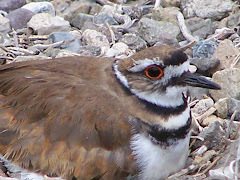 This bird is now seen regularly all year at Bolsa Chica Ecological Reserve. There are only 2 to 3 individual Reddish Egrets going by the reports of people who have seen them--but they are in the Bolsa Chica area all year. 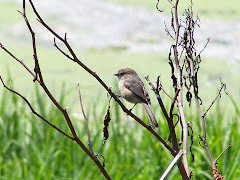 So if you want to see this rare bird, next time you go birding in Orange County, check out Bolsa Chica Ecological Reserve--you might just get lucky. Competing with a Red-breasted Merganser at Bolsa Chica Ecological Reserve . 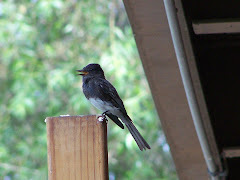 Check the Rare Bird Alert for Orange County for sightings. And the Audubon Society's profile of the Reddish Egret in their waterbird section. 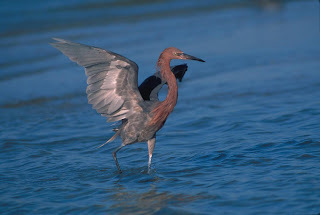 The State of Texas General Land Office page on their common resident, The Reddish Egret. University of Texas Information about their banding of Reddish Egrets and other information here. Audubon Texas and its local chapters have information about birds and places to bird in Texas including information about the Reddish Egret. Thanks to the US Department of Fish and Wildlife for the three photographs included above. My Video of a Reddish Egret feeding at Bolsa Chica Ecological Reserve. 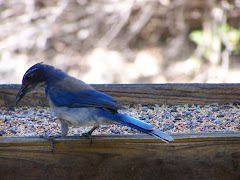 Copyright Karen McQuade, the OC Birder Girl. Internet Bird Collection Video of Reddish Egret's unusual feeding style. This great example of the feeding style of the Reddish Egret was video taped by Sharyn Staggers. I haven't seen a better one on the Internet.